A new study from the University of Texas at Austin suggests that bees exposed to glyphosate, the active ingredient in Roundup, lose some of the beneficial bacteria in their guts and are more susceptible to infection and death. The controversial herbicide Roundup has been accused of causing cancer in humans and now scientists in Texas argue that the world's most popular weed killer could be partly responsible for killing off bee populations around the world. 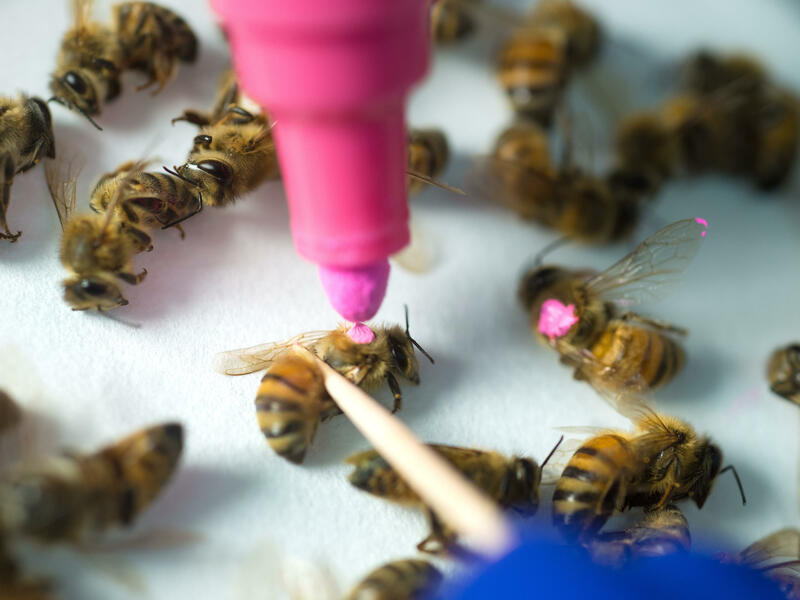 A new study by scientists at the University of Texas at Austin posit that glyphosate — the active ingredient in the herbicide — destroys specialized gut bacteria in bees, leaving them more susceptible to infection and death from harmful bacteria. Researchers Nancy Moran, Erick Motta and Kasie Raymann suggest their findings are evidence that glyphosate might be contributing to colony collapse disorder, a phenomenon that has been wreaking havoc on honey bees and native bees for more than a decade. They hope their results will convince farmers, landscapers and homeowners to stop spraying glyphosate-based herbicides on flowering plants that are likely to be pollinated by bees. "We need better guidelines for glyphosate use, especially regarding bee exposure, because right now the guidelines assume bees are not harmed by the herbicide," Motta, the graduate student who led the research, said according to the university. "Our study shows that's not true." The company that owns Roundup contests the findings published in the Proceedings of the National Academy of Sciences this week. "No large-scale study has ever found a link between glyphosate and honey bee health issues," Bayer said in a statement, adding that the new study "does not change that." In June, German-based pharmaceutical giant Bayer bought the agriculture behemoth Monsanto, the company that developed Roundup. Bayer noted the study relied on a small sample of individual bees and that it does not meet regulatory research criteria on pesticides stipulated by international guidelines developed by the Organization of Economic Cooperation and Development and other international organizations. Additionally, the company suggested it is "questionable whether the concentrations of the substance tested could at all be absorbed by bee populations in the open over a relevant period of time." According to the report in the journal, the researchers focused on honey bees and used "hundreds of adult worker bees from a single hive" and treated them with varying levels of glyphosate. "Native bumble bees have microbiomes similar to honey bees, so Moran said it's likely that they would be affected by glyphosate in a similar way," notes a release from the University of Texas at Austin.